Clover - уникальный файлменеджер, который добавит многовкладочность в Проводник Windows и невероятно усовершенствует навигацию по файловой структуре. Таким образом, после установки Clover появится возможность открывать несколько папок в одном окне; кроме этого, для быстрого доступа к избранным папкам можно будет устанавливать закладки. 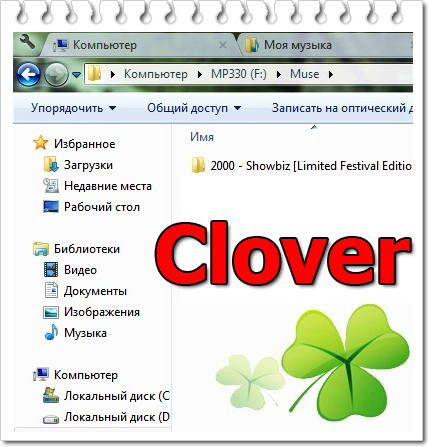 Clover is an extension of the Windows Explorer, to add multi-tab functionality similar to Google Chrome browser. After install Clover, you will be able to open multiple folders within the same window, and you can also add folder bookmarks. Clover adds Chrome-style tabs to Windows Explorer and allows you to quickly switch between multiple folders. The Clover tabs blend nicely with the standard Explorer window and feel like a natural addition. You can re-arrange tabs by simply dragging them into place, pin tabs so that theyre always accessible. Clover also adds a bookmark bar to the Explorer window that you can use to quickly open frequently used folders or websites with the click of a button.